TORONTO, May 24, 2018 /CNW/ - On June 1st, Tim Hortons will launch a limited-edition food creation to celebrate National Donut Day: The Honey Dip Donut Breakfast Sandwich. Paying homage to Tim Hortons heritage as Canada's donut leader, Guests will be able to enjoy their favourite classic breakfast sandwich on a Honey Dip donut. 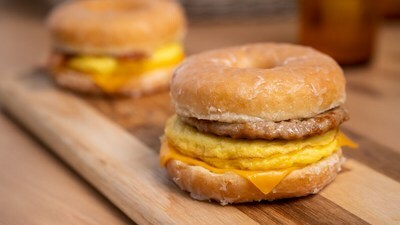 The sweet and savoury sandwich will be available for purchase at all Tim Hortons locations during breakfast hours. The Tim Hortons culinary team worked for months to find the right donut, and the winner was Honey Dip. The delicate sweetness of this donut balances perfectly with the smoky, savoury flavours of the classic breakfast sandwich. "We are excited to bring Canadians together with a fun food creation that pairs our breakfast sandwich with Canada's favourite treat," says Sami Siddiqui, President, Tim Hortons Canada. "For 54 years, donuts have been a core part of our heritage. Every day is donut day at Tim Hortons!" Spreading the National Donut Day love even further, Tim Hortons is giving Canadians the chance to win free donuts for a year. To enter, Guests can take a selfie with the Honey Dip Donut Breakfast Sandwich or their favourite Tims donut on June 1st and share on Twitter or Instagram using #TimsGoesDonuts, tagging @TimHortons. To complement the launch of the Honey Dip Donut Breakfast Sandwich, Tim Hortons provides "Timbits" of information on the brand's donut history with 10 fun (and yummy!) 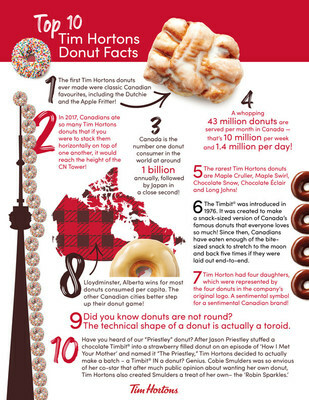 donut facts. TIM HORTONS® is one of North America's largest restaurant chains operating in the quick service segment. Founded as a single location in Canada in 1964, TIM HORTONS® appeals to a broad range of consumer tastes, with a menu that includes premium coffee, hot and cold specialty drinks (including lattes, cappuccinos and espresso shots), specialty teas and fruit smoothies, fresh baked goods, grilled Panini and classic sandwiches, wraps, soups, prepared foods and other food products. TIM HORTONS® has more than 4,600 system wide restaurants located in Canada, the United States, and around the world. To learn more about the TIM HORTONS® brand, please visit the TIM HORTONS® brand website at http://www.timhortons.com/ca or follow us on Facebook, Twitter and Instagram.